GO GREEN with energy-saving solar powered pond fountains for your golf course, resort, subdivision, public or municipal facility or residence. GO GREEN with energy-saving solar powered pond fountains for your golf course, resort, subdivision, public or municipal facility or residence. We are very excited to release the solar fountain product line from Outdoor Water Solutions. 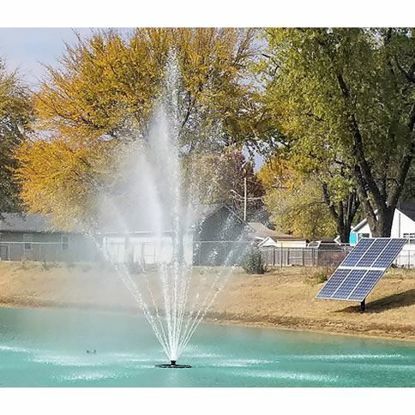 Instead of paying up to $300 a month to power a floating fountain, now it can be accomplished with solar power. Outdoor Water Solutions has developed the Classic™ Series Line of Solar Fountains featuring our unique Direct Drive™ (DD) Technology. These fountains are constructed using high quality pumps, motors and controllers designed to operate when others will not. Through our intense product testing, we provide the most efficient technology available allowing for more run time than others systems on the market.